The top-spec Aspire Titanium+ gets all the features that are on offer on the Figo Titanium Blu and some more. So what will the Aspire’s Blu variant be about? Aspire Titanium with Blu badge spotted, could be the new top variant. Cosmetic updates like Blu decals are similar to the Figo Blu. Aspire lineup might be restructured and the number of variants reduced. Ford is likely to introduce a new Blu variant of the Aspire. A Ford Aspire with ‘Blu’ badging on the boot was previously spotted on public roads and we didn’t know what to expect from this variant back then. However, with the launch of the 2019 Figo facelift, the top-spec variant of which is Titanium Blu, things have become a bit clearer. Like its hatchback counterpart, the Blu variant of the Aspire will, in all probability, sit above its other variants. The Aspire’s current top variant is the Titanium+. The Blu variant is likely to be based on this variant and will get cosmetic add-ons like decals, glossy black ORVMs, black roof, blacked-out alloy wheels and blue bezel around the fog lamp housing. On the inside, it should get leather-wrapped steering wheel, blue stitching on the seats and blue inserts on the doors, just like the Figo Titanium Blu. It remains to be seen if the Aspire Blu will get an all-black interior environment, like the Figo Blu, or continue to get beige-black theme. The Aspire Blu might only be a cosmetic update of the Aspire Titanium+ since all the features on offer on the Figo Blu are already available on the top-spec Aspire. The Aspire Titanium+ additionally gets the 6.5-inch touchscreen infotainment system with SYNC3, Apple CarPlay and Android Auto connectivity. 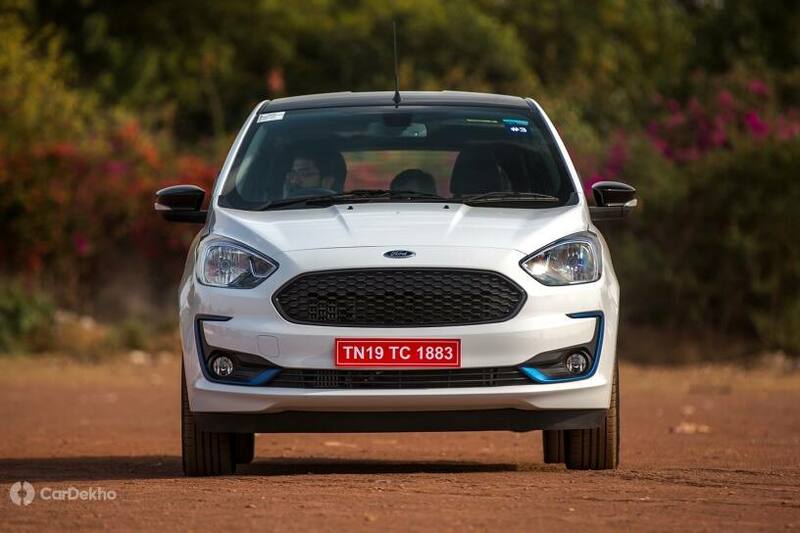 With the launch of the Aspire Blu, Ford might, however, restructure the Aspire lineup and reduce the number of variants on offer, like it did on the 2019 Figo facelift. Currently, the Aspire gets five variants -- Ambiente, Trend, Trend+, Titanium, Titanium+ -- out of which Trend+ and Titanium+ variants might get discontinued. It remains to be seen if the Trend variant will be discontinued or not since it’s the only other variant apart from the Ambiente to get the CNG fuel option. Currently, the Titanium+ Petrol variant of the Aspire (which is the top-spec petrol variant) is priced at Rs 7.45 lakh while the Titanium+ Diesel (top-spec diesel variant) is priced at Rs 8.25 lakh (ex-showroom India). The Aspire Titanium Blu variant is likely to be more expensive than the Titanium+. Stay tuned to CarDekho to find out more about the Blu variant of the Aspire, as and when Ford India reveals more information about it.